This summer the Mediterranean has been the scene of a rather brutal political game. The Italian government has worked to delegitimize NGOs operating in the area. 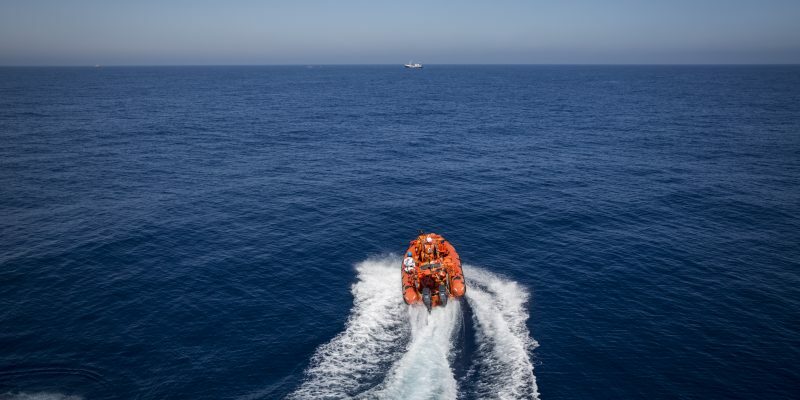 They have been forced to back away from, sometimes even renounce, their role in rescuing migrants, thereby allowing the Libyan Coast Guard free rein to continue its refoulements. In this framework, the documents on the seizure of the German ship Iuventa provide a basis for better understanding what has happened at sea over the last few months. In the seizure order for the Iuventa – the vessel used by the German NGO Jugend Rettet – the magistrates highlight its excessive proximity to the Libyan coast near Sabratha and the presence, during some rescue operations, of so-called “facilitators”, a relatively new figure explained here by Lorenzo Bagnoli. The Iuventa is described as “small and very old” (it is a 33-metre boat from 1962 that was specifically bought for rescue missions) and as “the boldest” among NGO ships. Furthermore, its crew is accused of “returning empty vessels to other individuals lingering in the rescue area on small wooden and fibreglass boats” when those rubber dinghies are to be “cut and scuttled” instead. It is worthwhile clarifying, however, that NGOs – including the smallest ones like Sea Watch and Jugend Rettet – have always followed and documented this practice though those in charge of such operations have never been specified and the police have even referred to it as destruction of evidence. In the documents, the humanitarian purpose and non-profit nature of the NGO is acknowledged, and that “no compensation” was received for the alleged offences. Nevertheless, the crew of the Iuventa might still have been reckless enough to break the law with individual episodes of seemingly “agreed deliveries” of migrants. Every charge must be proven in court in the months to come; the first article we published about the seizure explains the nature of such allegations and the more general context they reveal. Those elements related to the general “climate” contained in the papers seem to portray an “antagonistic” NGO, which may or may not have pushed the Iuventa too close to the coast and to so-called “facilitators”; be that as it may, this is by no means indictable per se. It is important to remember that some NGOs use their own boats for rescue operations, while others, usually the largest and most organised ones, rent suitable vessels from private shipowners who often hire armed guards to guarantee their safety. The pending charges against the Iuventa as well as the subsequent wiretaps and bugging involve some of these privately hired security guards, in particular on board the Von Hestia ship used by Save the Children. In the documents, they mix gossip, second-hand information, allusions, personal dislikes, prejudices, and profound gaps in knowledge. For example, they do not know why NGOs cannot participate in police operations involving those rescued or in actions leading to forced repatriations; nor that the “smugglers” aboard the dinghies (or the helmsmen, more precisely) are often migrants themselves who agree to steer the vessels in exchange for the price of their journey; nor that Italy has made more than one mistake in the identification of alleged smugglers, the most striking one being the Mered case. Considering that the Libyan Coast Guard is the main ally of the Italian government in stopping migration flows at the moment, it is interesting to read that the police were paying special attention to their conduct up until just a few weeks ago. This happened in a context in which the UN accused the Libyan Coast Guard of conniving with smugglers, and in which some Libyan police adopted extremely aggressive behaviour with NGO ships in international waters, including shootings and volleys of gunfire (the most critical episode resulted in Sea Watch reporting the Libyan Coast Guard to the International Court of Justice; the most recent is the two-hour seizure of the ProActiva Open Arms ship on August 15). And it is precisely within this context, after disobeying the instructions of the Italian Coast Guard (Imrcc) on one occasion, that, as a sort of punishment, the Iuventa was forced to dock in Lampedusa to disembark only a few people (instead of moving them to another ship and remaining on the open sea). On this occasion, the police questioned the crew in a climate that the operators have described as non-hostile. The documents quote the questions asked by policemen multiple times, which did not focus on the behaviour of Jugend Rettet at sea, but rather on that of the Libyan Coast Guard (which was also present during one of the critical episodes for the Iuventa, on June 18, 2017). The German NGO Jugend Rettet, together with other NGOs, chose not to sign the Interior Ministry’s code of conduct on July 31, and the seizure order was issued August 2. The deputy prosecutor of Trapani maintains that this “has nothing to do with the NGO refusing to sign the code of conduct.” The documents, however, reveal that while the first of the three episodes for which the Iuventa is accused took place in September 2016, the other two occurred in mid-June 2017, which was after the commotion caused by Catania’s prosecutor Zuccaro after the rescues during Easter (could it be considered a warning to the Iuventa? ), and before the delegitimization campaign against NGOs during the negotiations for the code of conduct in August. But one doubt still remains: why was the seizure of the Iuventa ordered less than 48 hours after the refusal to sign, not one month earlier or one month later? And had Jugend Rettet signed, what would have happened? When would they have been informed that they were under investigation? Or was the hope that the Iuventa, after accepting, would stop of its own accord? From the papers, it appears that the Iuventa usually acted as both a first aid and a rescue “platform” which did not ever take the migrants directly to port, but transferred them to those ships indicated by the Coast Guard before going back to the open sea. Signing the prohibition to transfer people to other vessels, save extraordinary cases, would have forced the Iuventa to have to reach the first safe harbour and disembark those it had rescued every single time, and thus keep it away from the front line for several hours. Another concern is that the Iuventa could potentially cause an accident that would compromise the image of all NGOs at a moment when there are those seeking any excuse to exclude them from the rescue missions. In addition, keeping an eye on the near future when Libyan ships come into action as per the agreement with the Italian government, going too far and seeing too many vessels could paradoxically become a way of denouncing migrants and helping with refoulements as NGOs would then be forced to communicate the sightings without being able to intervene. Though the Interior Ministry’s code of conduct insisted on the presence of armed policemen aboard and prohibited the transfer of passengers, the true core of the problem has always been the 12 or 24-mile limit. This comes out very clearly in the wire-tappings, whether favourable or unfavourable to the Iuventa, which is why the points of the NGO code of conduct (or of “mass distraction”, as it has been called) look more and more paradoxical and completely outdated in the face of recent events. The real question – and, as the papers show, the NGOs understood it very well – was just how far these organisations and their rescue missions would physically be allowed to go, and how to avoid finding themselves forced to cooperate with refoulements. “We don’t have a problem today, but we’ll have one in a month’s time [when] there’ll be more Libyan ships,” someone says, referring to the risky behaviour of the Iuventa. And as regards MSF (Doctors without Borders): “If the rules of engagement go beyond humanitarian purposes, they will take a step back” (which is exactly what eventually happened). Truth be told, even the Italian Coast Guard often reached the 12-mile limit in the past in full compliance with the law. But now, reading about this age-old problem almost makes one laugh; the Libyan Coast Guard has unilaterally extended its area of competence up to about 100 miles without any objection from the Italian government. One could almost think that, from the very beginning, the plan was to push everyone away and leave a free hand to Libyan refoulements, neutralising both rescue missions and the testimonies of the NGOs.